Cinema has been a major turning point in the lifestyle and culture of India since its inception. Apart from changing the standards and mentality, cinema has done a considerable amount of work in glorifying many accustomed places, which were of less significance then. Movies have, consequently, promoted tourism and visitors to exploit these trivial places and have got them on the world map. How about visiting these Bollywood spots this year? You may bump into some shoot, who knows! If you are determined to explore more of these explored locations, then here is the article for you. Read on and get to know some really awe-inspiring places in India. Situated in the Western Himalayas and now a popular destination for winter sports, Gulmarg came into prominence in the early 60s, after this beautiful place became the summer destination for directors and actors. Gulmarg, literally translated as meadow of flowers, undoubtedly, has been a place full of natural wonders, which assuredly attracted cameras, lights and a little bit of action. The lush-green meadows, towering Himalayas, mini-lakes and forests of green pine, altogether make Gulmarg an idyllic destination for filming and shooting breathtaking views. Filmmakers could never resist themselves to capture this heavenly beauty in their cameras and hence, ended up producing legends like Bobby, Jab Tak Hai Jaan, Haider, Yeh Jawaani Hai Deewani and many more. Who thought that one day tea plantations would also become part of tourism and visitors in endless numbers would arrive to savour them? Well, filmmakers thought of it and through their movies gave this beauty what it deserves, immense popularity. Kerala is the place which never fails to surprise people, be it tourists, travellers, filmmakers or anyone for that matter. Who can forget Shah Rukh Khan romancing Deepika Padukone in Chennai Express or Jiah falling in love with Vijay in Nishabd amidst these tea gardens? Now, it is definitely objectionable to film Kerala and not add the unceasing charm of these tea plantations. Some other movies filmed here include Life Of Pi, Gupt, etc. A high mountain pass located in the Himalayas, Rohtang Pass has been an idyllic and peaceful filming location since the last three decades. The picturesque views of sky-high Himalayas surrounding pristine valleys get this place on the bucket list of every director and filmmaker. The roads stretching over kilometres and wiring mountain ranges have been made famous in numerous movies. Movies like Jab We Met, Dev D and Highway were filmed here. How about visiting this wonderful location and exploring the best of it? Be it any historical movie, Bollywood will add some epic scenes of old palaces and forts. And when the bet is on forts, monuments or royal palaces, Rajasthan can never be out of the discussion. Innumerable movies have been filmed in this royal state of Rajasthan. 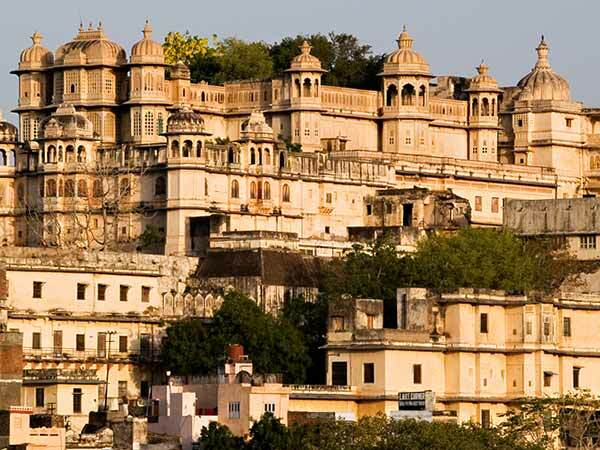 Udaipur is one such place which rose to prominence and became the history hub after it was shown on the 70mm screen. Movies like Guide, Eklavya and Khuda Gawah were shot in this beautiful city of historical and cultural significance. Its popularity increased with Goliyon Ki Raasleela Ram-Leela, which was shot in Udaipur Palace and other parts of the city. Today, Udaipur is one of the most-visited destinations in Rajasthan with millions of tourists seen exploring its beauty every year. Another exquisite place of India which rose to prominence through Bollywood, Darjeeling is a famous hill station now, significantly known as one of the best honeymoon destinations in India. From captivating tea gardens to the legendary Himalayas, every bit of this place is unforgettable and has been capturing the attention of filmmakers since the romantic era. Movies like Main Hoon Na, Jagga Jasoos, Barfi and Parineeta were filmed here. The beauty of this place scattered all around always compels filmmakers to take innumerable shots. Today, Darjeeling is one of the most-visited hill stations in India, owing its fame to Bollywood.